While at the Rhode Island School of Design, I teamed up with folks at the Brown University Environmental Sciences Department, and we designed plans for an ecological laboratory for the fourth floor of a building that housed a 'Nature Lab' on the first floor. The Nature Lab at RISD is a sort of library collection of shells, seed pods, leaves, skeletons, and other natural artifacts from all over the world categorically indexed like a Library. The 'EcoLab' on the fourth floor of that building was thought to be an extension of this natural repository, only instead of showcasing dead animals and plants, it would showcase natural living ecologies. In this case, the ecologies would work together to process waste water from the restrooms on the fourth floor. This 'living ecology' would break down and clean the waste in a setting where students would be able to learn about the natural processes involved, and where students could also run tests and experiments on the system to engage it and explore it's operating principles. This diagram demonstrates a smaller version of this living ecological system for waste water treatment. It is modeled on a combination of John Todd's 'Living Machine' and Zeri's Integrated Waste water Treatment System (with special influence from George Chan). 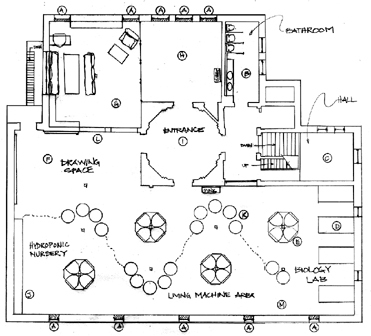 Below is a floor-plan we developed for the classroom, with minimal redesign of the extant floors and wall structures. In addition to the lab design, a curriculum was developed for High School and Middle School students. That file is available here for download. I would simply ask that if you use it, you attribute it's source.